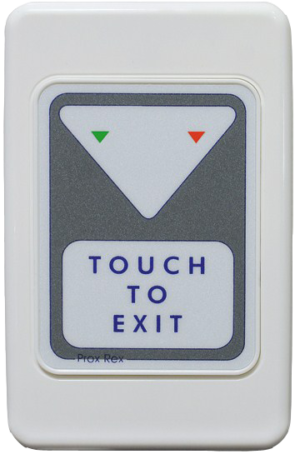 The Prox-Rex® (Touch to Exit) is a touchless egress unit designed for use with Access Control Systems and is an ideal replacement for conventional push buttons, door release buttons, call switches, etc. Requires only the touch of a finger to activate, making it perfect for fast and easy egress and an advantage for the elderly and disabled. Vandal-Resistant – all components are behind the plate. Perfect replacement for door release buttons that are in high usage areas. Ideal for areas where infection control is important. Two LED indicators provide visual confirmation for: Red for heartbeat and Green for operated.